Rachel Stanners spoke to Preethi Sundaram and Jo Chevalier at her home in Brixton about their first endeavour to run their own café called PJ’s at the Making Uncovered event in April at the Brixton East Gallery. Preethi and Jo both started out their lives in Brixton by renting a room from me and now have found their own flats with their partners nearby. In a planning meeting I attended about Making Uncovered I heard we needed someone to organise a café for the event and immediately thought of Preethi and Jo. Both of them are fantastic hosts. Preethi has always wanted to set up her own café and is always creating new delicious recipes, and Jo is the baker in my life and another fellow creative. I knew together they would make a perfect team. I proposed the idea over dinner one night but asked them to think carefully about whether or not they could manage it around their demanding jobs. Jo is a primary school teacher at Sudbourne Primary School and Preethi works as a women’s rights campaigner for the Fawcett society. Lucky for us, they agreed! How long have you lived in Brixton? Preethi: One year, since March 2012. Jo: Nearly four years now. Why did you decide to do the café? Preethi: Because you asked us to! Jo: Because you bullied us into it! Preethi: No seriously, Making Uncovered sounded like an exciting, fun and creative event being run in our local community and we wanted to be a part of it. Preethi: Not before this event, although lots of people at the event thought we did run a café full-time and asked us where it was! Preethi: Making a relaxed and fun environment for people to hang out in. Jo: Making a pretty space. And the cakes! Jo: Giving someone food poisoning!! Preethi: Managing to organise it well when we are both so busy. What went into organising the event? Jo: We had a couple of meetings in which we delegated tasks. Preethi: It was actually quite relaxed. We overlapped our jobs quite a bit but generally I was in charge of finding bakers and Jo was in charge of the aesthetics. So who made all the delicious cakes? Jo: … and I recruited fellow teachers, even a mum from school and lots of my friends. We also had friends and family of the Makerhood team. We were overwhelmed by how kind everyone was to volunteer and their refusal to accept payment for their ingredients. We are really grateful to them. How did you go about decorating the café? Preethi: We emptied our houses and put it all into the space! The design idea was to be simple and pretty. Jo: We had a grey and yellow theme and lots of decorations but when we got to the venue we realised it didn’t need very much. It was a dream venue that really spoke for itself. How did you feel it went? Preethi: We loved it! It felt like a raving success. I was surprised by how much we sold. We sold everything – except some sweeties. Jo: We were so pleased with how pretty the space looked and surprised how well it went, considering we had no previous experience. I was amazed at how much people love tea and cake. Jo: We made a happy space and it was lovely to see friends chatting over tea and cake and really appreciate it. Preethi: It made me want to open my own place. I can see there is a lot of joy in serving people a simple cup of tea. I loved interacting with strangers and meeting people from Jo’s school. Jo: I think almost the whole of Sudbourne showed up! Why do you love Brixton? Jo: It’s an eclectic cocktail of people and places, and no day ever feels the same. Preethi: It’s so vibrant! It feels like a place on the brink of something big and exciting happening. What are your favourite Brixton spots? Jo: Rosies. It was the first place I went to in the village. It had bunting in it and I knew straight away I would be happy here in Brixton. Preethi: My favourite spot is at the top of Brockwell Park – you can see all of the city of London. It’s a fantastic view! Mariatu Turay of Gitas Portal specialises in contemporary, African-inspired ladies’ and children’s fashion, handmade slippers, jewellery and handbags. At Making Uncovered she will be showing how to make fabric headbands for children and adults, and how to make the best use of your leftover fabrics by turning them into coin purses. What do you like about your art/craft? Why did you get into it? I love the fact that I have free rein to bring an idea or vision to life and that my customers appreciate what I do. I got into it because I thoroughly enjoy designing and making clothes and accessories and I come alive when I do – can’t help myself. Why are you taking part in making uncovered? It’s a fantastic opportunity to meet people and share what I do and engage others in the actual making process, which ordinarily would be behind the scenes. People usually see the finished produce and not the making process. What will you be teaching people and why should they sign up? I’ll be running short, 20-minute workshops showing people how to make little purses and simple headbands that could also be used as a neckpiece. If you’ve got strips of material lying about in the house and you want to do something that’s simple, quick and fun to give to friends, with that added personal touch (you made it), then come along. 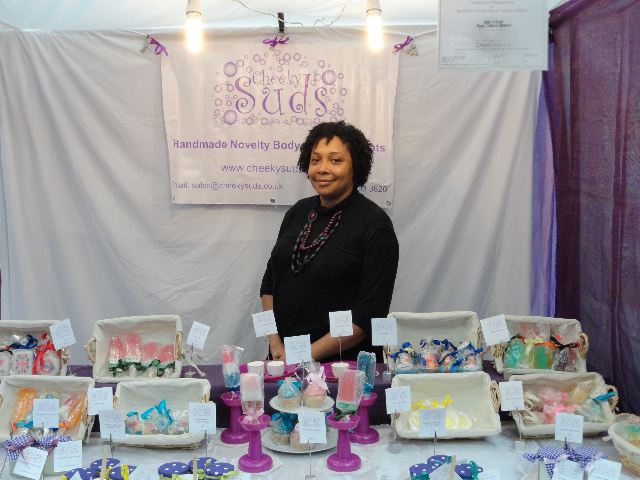 Cheeky Suds makes vegan-friendly, unusual and fun bath and body cosmetics, and was started by Chloe Morais from Brixton. At Making Uncovered on 20 April Chloe will be showing how to make body products and teaching a workshop. What do you like about your craft – and how did you get into it? I started working on body products because I wanted a change of career and longed to do something more creative than what I was previously doing. The thing I love about cosmetics is that it gives me a chance to be creative in terms of design, fragrances and product ranges. I can make anything, from soaps, lip balms and body scrubs to bath melts, creamers and soufflés. The possibilities are endless so I can always explore and add new products to my range. I recently made soap for my brother that smells of freshly mown grass because he loves the smell. Chocolate is another favourite! I’m taking part because I’d like to share my craft and creativity with people who might not otherwise have the opportunity to try it for themselves. It’s also a nice way to meet lots of other crafts and local people and give something back to the community. What will you be teaching at your workshop? I am doing a workshop on making bath bombs. If you want to add some fun, fizz and sweet aroma to your bath time whilst learning a new craft, then my workshop will be a great place to be! Bath bombs make bathing fun and fizzy – and smell lovely. They also make a fantastic gift to give to someone else. Elena Blanco is a Spanish-born artist living in Loughborough Junction. At Making Uncovered on 20 April, she will be popping up different points throughout the day drawing and engaging with the public. What do you like about your art? Why did you get into it? I have always enjoyed being creative and had lots of ideas. I studied architecture and that gave me drawing and design skills – but I didn’t like working as an architect. It was too serious and stressful, and not that creative as in “let yourself go” which is what I like about art (although I still love drawing urban landscapes and buildings). Drawing is a way of calming my mind, connecting with the world and myself. It’s a bit like meditating. Illustration taps into my imagination, my inner child, and also satisfies my interest in design. I loved the idea from the beginning: of bringing makers together to display their skills and techniques. I think it will be such an enjoyable event, because making and creating make people so happy. And getting together to make is such a beautiful sharing act. I read an article about traditional Innuit communities, how they all get together in the evenings to make their art. And I have seen that myself in Spain, my grandmother and her mates getting together on chairs outside the front door, to do their sewing and knitting, sharing ideas, doing their gossip. It was beautiful to see and listen to! What will you be doing at Making Uncovered people and why should they sign up? I want to teach people about the joys of making, in my case illustrating and drawing. I want them to see how art is about enjoyment, acceptance, experimenting and practising – nothing else, no good or bad. I’ve got a beautiful quote from Rilke (that amazing poet and person) that inspires me a lot: “Works of art are of an infinite solitude and no means of approach is so useless as criticism. Only love can touch and hold them and be fair with them.” I’ll teach some very fun techniques that are great icebreakers for people scared of the blank page. Pam Williams is a Brixton artist who has worked in the UK and internationally, from Europe to the US to Hong Kong painting, drawing and teaching art. Pam will teach a drop-in drawing workshop at Making Uncovered on 20 April at 11am. I’ve been a professional artist for over 30 years. I’ve loved art from an early age – it was the most enjoyable activity at school for me, always fun, always new and stimulating. So I love to share and teach art skills, whether to children or adults. I’m taking part in Making Uncovered to support local artists and to help bring the awareness of the importance of drawing to the community. It is a powerful learning tool for us all as we grow in all walks of life. During my workshop I will be demonstrating and talking about ‘what to look for when we sketch’ – what we need to understand to create a strong foundation for our art. I’ll also be showing my new spring/summer collection of Brixton T-Shirts and Brixton sketches. Rachel Stanners of PricklePress explains her craft and her workshop at Making Uncovered on 20 April. 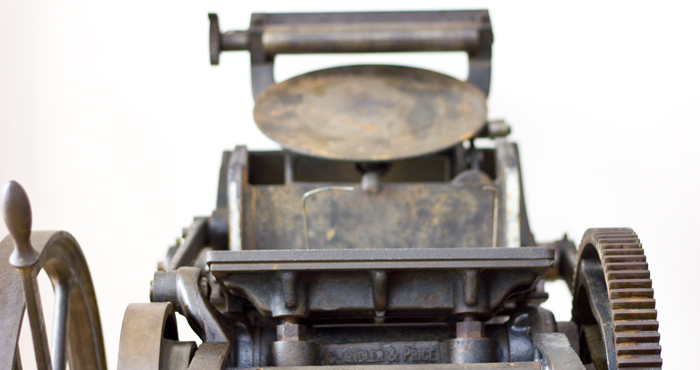 Tell us about letter-pressing – what do you like about it and what brought you to doing it? Letterpress dates back to the fifteenth century. It is an old, tactile craft that requires time, focus and skill to design and typeset faultlessly, master the machinery and produce a perfect print. Each piece of card is fed through the press, piled and cut by hand. The result is something you will instantly want to stroke, collect, frame or gift away. I took up letterpress printing in 2009 when my partner and I bought a small hand-operated Adana letterpress. Although I found the amount of time and detail that went into every print run exhausting it was always worth the effort! Until I tried letterpress I had never given so much time to one craft and it’s been rewarding to see my skill improve over the years. Why are you taking part in Making Uncovered on 20 April? I’d love to share the craft of letterpress. Some people have heard of letterpress but most don’t understand how it works or why letterpress goods are expensive. I spend so much time explaining letterpress that when an opportunity came along to actually show people how it works I jumped at the chance. It’s not until you see a letterpress in action that you understand why it’s so special. I am going to be doing a few demonstrations throughout the day but I also want to use this opportunity to make letterpress accessible. So, I’m giving a couple of people the chance to learn how to letterpress and print their own postcard designs: anything from a fun postcard to save-the-dates, birthday invitations, birth announcements. You can design them yourself, ask me to help or use vintage wooden type to create something truly unique. On the day we will ink up the press and print up to fifty postcards on 100% cotton card. It will cost between £30-150, depending on the complexity of your design. The price includes all the material costs. There’s only two spaces available so get in quick! Please get in touch before April 10 if you are interested. Brixton’s very own willow-weaver Sarah Lovett talks about her craft and her show at Making Uncovered on 20 April. I am interested in permaculture and sustainability. Four years ago I planted 600 willows in West Somerset. I call my venture Naughty Magpie Willows. Every year in the winter while the plants are dormant I cut them all down and sort the slender wands into bundles. It is hard work but satisfying. I then have a crop of green willow, which can be planted and grow into structures like tunnels, wigwams and domes. It can also be woven into various useful things for the house and garden. What will you be showing at Making Uncovered? I am very pleased to be able to share my skills with you! 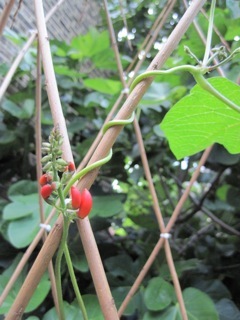 I will be introducing my one of a kind bean climber – an obelisk frame which you can grow lovely orange runner bean flowers up, or clematis, cucumbers or morning glories. It is suitable for the garden, balcony or patio, and helps make the most of a small space to grow vegetables or flowers. While you are waiting for the plants to grow, you can hang a bird feeder in the top and watch the little birds fertilise your bean plants while they peck the food. All you need to do is to find a big container, or plant pot, fill it with soil, plant your beans in it and plonk the frame over the top, you might have to tie it on in case its windy. Make sure it is watered and soon you will have a feature covered in free food! 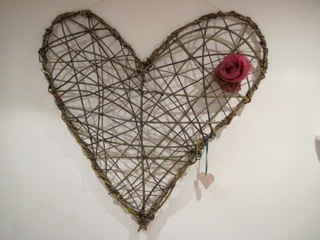 I will also have with me large willow hearts designed to decorate the wall, bringing the outside inside. The hearts look fantastic on a feature wall in the living room, great as a notice board in the kitchen, or a hanger in the hallway. Make your own plant climber! If you would like to make a plant climber for yourself, or as a present for someone else, book your place at my workshop at Making Uncovered – there are only eight places. 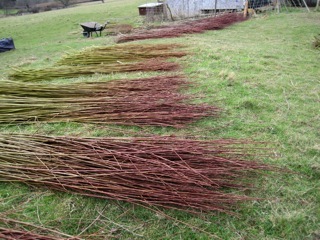 I will demonstrate the easy to follow technique and then you can choose a dozen willow wands and begin to make your own climber with a little help from me. It is a lot of fun. Don’t worry about it being too big to carry, the structure collapses like an umbrella when you take the ring out of the bottom, so you have a long bundle and a ring to carry. More fun on the bus! This activity is for adults. If you have a pair of secateurs bring them, but I have a few pairs we can use. You can book your place at the workshop here. Our writers also show professionalism when it comes to maintaining a proper tone and voice throughout the dissertation. Complete control over this aspect is what separates dissertation writers from essay and term paper writers. You will notice a flow of ideas in your dissertation and arguments will always be logical and sustained. Today we announce Making Uncovered. We’ve been working on the event for a few months and could hardly contain the excitement. It’s great to be able to invite you all to it! Making Uncovered was conceived by a group of Brixton makers as a way to share their art and craft with the broader public. When we buy handmade – which we all increasingly do and which is wonderful – we rarely appreciate the talent, the love, the time and the skill that goes into the process of creating objects by hand. We thought it was time to take the next step – from promoting makers’ work to showcasing their practices, ways of working, and their passion. The event on Saturday 20 April brings together 17 different art and craft disciplines. In art, we’ll have painting and drawing, screen printing and letter-pressing, and aboriginal art techniques that have travelled to Brixton all the way from Australia. In textiles, we are showing felting, African accessory-making, affirmative applique, knitting, crochet, and how to make cushions, bow ties and handbags. Perhaps more unusual to the city dweller are the two traditional woodworking crafts on show: willow-weaving and green woodworking. For the body, we’ll look at how to make shower scrubs and soaps. For the soul, we’ll build a community map, and look at how we make meaning in our lives using images. Demonstrations will take place from 11am till 6pm, and many stalls will have drop-in sessions where you can ask questions, and have a go at trying something yourself. They are free to attend, and everyone is welcome. We will also have several longer workshops which need to be pre-booked and offer a more in-depth opportunity for learning crafts like wood-working, aboriginal art and soap making – and more. At 6pm, the wise heads at the Thought Menu will join us for an hour of reflection and talks in a warm atmosphere, over some food. We’re delighted to host their first south London outing. The topic this time is, inevitably, “making”. In the evening, we’ll have a wonderful programme of music, comedy, improv and dance – started off by south London’s 24 strong pop-up choir! It’s a chance to meet new people, relax after a long day over a few drinks, and enjoy fantastic performances in Brixton’s most beautiful gallery. Making Uncovered goes on from 11am to 11pm, entry is free, and you can drop in any time, for as long as you like. The venue is 5 minutes walk from Brixton Tube. To book your free ticket, go to our Eventbrite page. For all details about the event, go to www.makinguncovered.com. A big thank you also goes to our supporters – Diverse gifts shop, WBC and Brixton Market– who have helped make this event a reality. Images by Maggie Winnal from Sewin Studio and Rachel Stanners from Prickle Press. The event flyer is by Elena Blanco from DreamyMe.